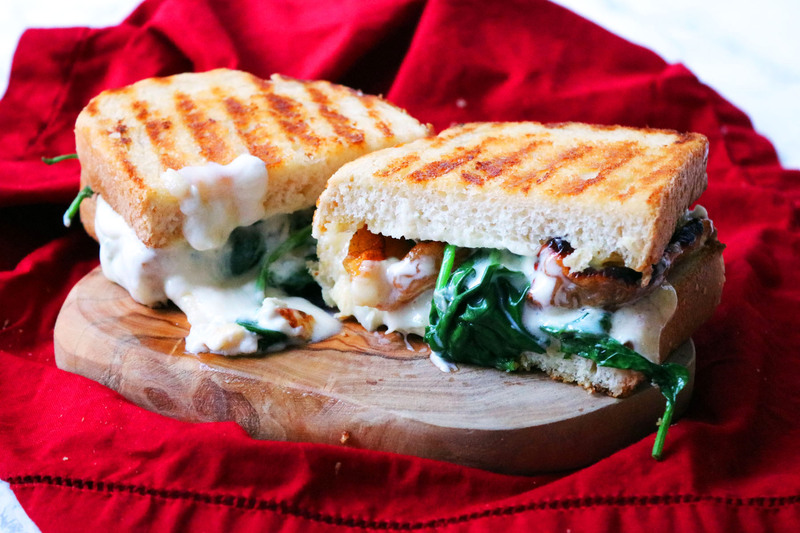 Creamy Gorgonzola, sweet pear and earthy spinach combine to make an epic toasted sandwich like you’ve never tasted before. Well this cheese toastie is special. So special in fact that I’ve declared its going to form part of a new Christmas tradition – going out and choosing a Christmas tree then coming home to eat this decadent grilled cheese sandwich. It’s the perfect mix of sweet, savoury and oh so cheesey! The gooey centre is encased in two buttery, crisp slices of white bread that soak up the flavours of the filling. The second that the calendar changes over to December, something just flips in my brain and all I can think about is cheese. It’s probably not helped by the fact that if you walk into a supermarket there are multi-buy deals left, right and centre and farmers markets are always packed with cheese mongers selling their special varieties. If its less than 25 days until Christmas you can guarantee that 50% of my fridge is packed full of cheese. Sunday dinner in December often becomes cheese and crackers. It’s a simple supper but one that really hits the spot when you’re snuggled under a blanket and watching a Christmas film. That being said, it’s sometimes good to mix things up. So, after buying my Christmas tree this weekend, I was looking for something warm and filling. My fridge was full of cheese and so it just has to be a humble cheese toastie, pimped up for Christmas. Gorgonzola is the kind of cheese that gets sidelined all too quickly on the Christmas cheeseboard. Cheddar is a true classic so there’s no risk that it will get left behind. Brie is pretty popular too so there’s no chance there will be enough left to make a toastie. Gorgonzola on the other hand is the perfect choice. It’s creamy and melts well and you probably won’t have to fight anyone for it. At this time of year I have lots of other weird and wonderful treats in the cupboard – like dried pear. It might not be the most obvious of toasted sandwich fillings but when it becomes en-robed in molten Gorgonzola it just makes so much sense. Each mouthful of this cheese toastie is bursting with creamy, sweet, salty and bitter flavour. If you think you know what a good cheese toastie tasty likes, think again. 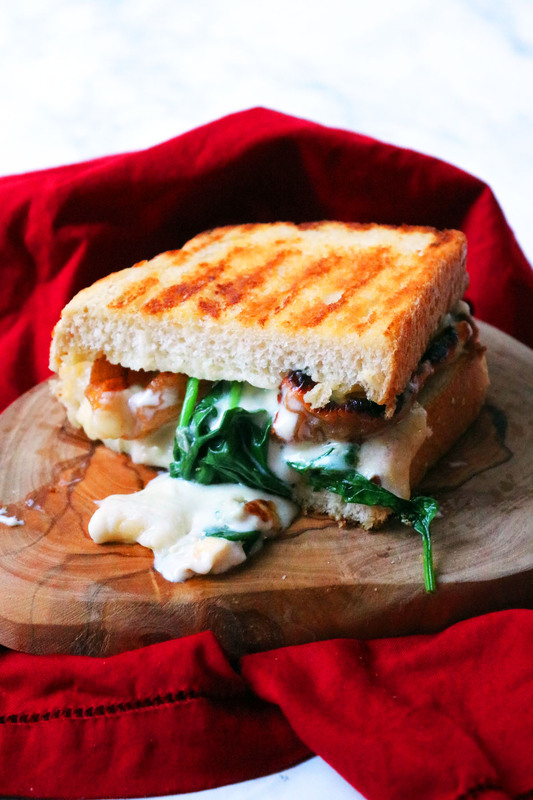 Creamy Gorgonzola, sweet pear and earthy spinach combine to make an epic toasted sandwich like you've never tasted before. Spread the two slices of bread with the butter. Heat a griddle pan on high then place the slices of bread butter side down into the pan. Cook the bread for 2-3 minutes until the butter has melted, the bread is crisp and there are clear griddle lines on the surface of the bread. Place the bread, crisped side down, on to a grill tray. On one slide, top with the spinach and half of the gorgonzola. Top the other slice with the gorgonzola followed by the pear. Place under the grill for 5 minutes until the cheese has melted. Sandwich the two slices together and cut in half to serve. I’m not sure I’ve ever tried dried pear but I’m all over a gorgonzola toastie. For me Christmas is ALL about the cheese.